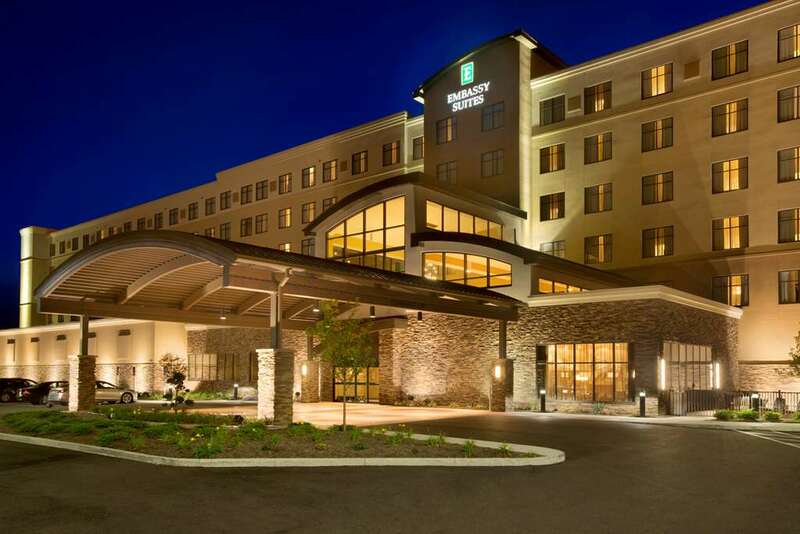 Ideally located in a beautiful suburban area near the Airport Embassy Suites Akron-Canton Airport offers the perfect base for business trips and corporate meetings as well as visitors to this historic Midwestern area. Our contemporary two-room suites offer enough space to stretch out and relax. Each suite boasts a comfortable living area with sofa bed and modern amenities such as a 42-inch LCD TV and WiFi. A Keurig coffee maker fridge and microwave will also make you feel at home. Maintain your exercise regime in the well-equipped fitness center or swim lengths in the heated indoor pool. If business is on the agenda we offer over 5 000 sq. ft. of meeting and event space for business meetings weddings and special events with up to 500 guests. Visit our onsite restaurant to sample our complimentary cooked-to-order breakfast. Classic American favorites are also available for lunch and dinner and we offer a full service bar. If you prefer the convenience of dining in your suite order from our delicious room service menu or pick up snacks from the 24-hour convenience store. Driftwood ModernAmericanBistro: Full service restaurant featuring a wide variety of American dishes including appetizers steaks chicken seafood pasta salads and sandwiches. Many delicious desserts and full bar service also available.